While the rate of imprisonment in India is comparatively low by global standards at 30 per 100,000, the rate of pre-trial detention is particularly high with 67% of detainees awaiting trial. The same is true of pre-trial detention in Pakistan with pre-trial detainees making up 69% of the prison population and in Bangladesh 73.8%. Prisons in all three countries are severely overcrowded. India’s prison system is operating at 117% of its capacity, Bangladesh at 201% and Pakistan at 171%, according to the latest figures from the World Prison Brief. The Human Rights Commission in Pakistan reported in 2014, for example, that in some prisons ‘a few convicts had to stand while the others slept or prisoners could not access the washroom in the night because sleeping prisoners covered the entire barrack floor’. While there is a trend towards rehabilitative models of justice, non-custodial alternatives are still rarely applied and there are huge challenges to implementation. We work with local civil society partners and prison, probation and police officials as well as the judiciary to promote non-custodial measures and good prison management. We conduct and publish research, including reports on alternatives to imprisonment in Pakistan and in Bangladesh, and work with criminal justice stakeholders to take its recommendations forward. 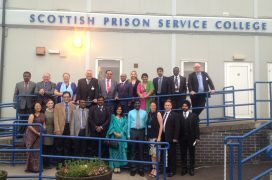 We promote good practice and share expertise on alternatives to imprisonment within the region. We provide training for prison managers on international standards and good practice, and for criminal justice professionals on developing and implementing alternative measures.